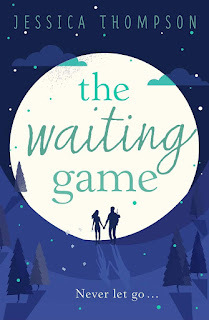 Today I am delighted to have an extract from The Waiting Game by Jessica Thompson as part of the Blog Tour. ‘He’s not so good today,’ Betsy whispered, gazing at him lovingly. The three ladies stood at the door frame in the semi-darkness. He liked it that way: dark. It was sad. Nessa silently put her arm around Betsy’s bony shoulder and pulled her close. Sometimes, she wished she could click her fingers and make it all OK. The gentle sound of a ticking clock was strangely intrusive. The atmosphere was electric because you never knew what Mick was about to do next. He watched silently as cars sped by, flashes of yellow, blue and gunmetal grey. The women stared at him from a distance. His bony hands were clasped together in front of his stomach, shard-like knuckles protruded from them, his veins like cables. Even from a few metres away, it was obvious that this was a man lost within his own mind. He looked confused. Betsy gestured silently towards the kitchen and they walked away from the room quietly. He had been a fine man, Mick Bruce, really one of the very best: a true gentleman with a big heart. Betsy and Mick had met at a mutual friend’s twenty-first birthday party in a village hall in Ide Hill, Kent. The possibilities of life had seemed endless then. They had their whole lives ahead of them. But it had gone so fast! Mick had spotted 19-year-old Betsy across the room, holding a glass of flat cola and staring at her pale, sandalled feet. She was wearing a baby blue midi dress, and was the only girl at the party with her ample breasts tucked away and her legs mostly covered. Her hair was shoulder length, and curled up at the edges. A friend had drawn on some eyeliner in the toilets just an hour before. The flicks were almost perfectly executed, if you could ignore the fact that the left one was noticeably higher than the right. ‘Who’s that?’ Mick had asked a friend, unable to stop looking at her. He had torn his glance away momentarily, to brush a few large beads of beer froth from his checked shirt. ‘Oh god, that’s Betsy. She’s a square . . . She’s so boring, I’m surprised she’s even here,’ his friend Padstow had replied, rolling his eyes and passing Mick another beer. ‘Ha, yeah, she looks kinda dull,’ Mick had said, laughing, but unable to shake his instant obsession towards this slender, blonde stranger, who seemed to be totally detached from the world around her. Why was she even at the party, he wondered. She looked as if it was the last place she wanted to be. Eventually, a red cheeked and smiley friend had prised the object of Mick’s affections away from the wall, and eased her towards the dance floor. Mick, locked in fascination, had watched her through the crowds. A soft smile tugged at the corners of his mouth as he took an occasional sip of cold beer and felt something slip and slide within him, to be lost forever. Betsy Taylor was the most awkwardly beautiful thing he’d ever seen. Published by Coronet in paperback on August 13th 2015. I would like to thank the publishers for my copy of this book via Bookbridgr, in return for an honest review and for taking part in the blog tour. Nessa Bruce has the perfect life on paper, but in reality, her life is far from perfect. After finding herself pregnant at seventeen, Nessa gave up her dream of becoming a midwife to raise her daughter, Poppy. However, Poppy now thinks that her mother is failure, because she is the manager of a small library, instead of following her dreams to become the midwife she has always wanted to be. Nessa's husband Jake is the man of her dreams, but Nessa wishes more than anything that he would give up his job in the army and stay at home with his family. Poppy is finding it hard to cope, not having her father around and is starting to rebel, which sees her shoplifting and turning into a typical rebellious teen. All Nessa and Poppy can hope for is that Jake will be able to bring things back to normal when he returns home after a tour in Afghanistan. But Jake doesn't return home, turning Nessa and Poppy's lives upside down in the process. Never giving up hope that Jake is out there somewhere waiting to get home, the two try to get their life back on tack. But as time moves on and there is still no sign of Jake, Nessa is forced to try to move on with her life as best she can, and keep hoping beyond hope that the man she loves will come back into her life eventually. I really can't find the words to praise this book enough! Everything about it is beautiful, from the gorgeous striking cover, to the wonderfully written, heartbreaking story inside. I have read a lot of books, but none with as much emotion as this one. I laughed and cried, and I didn't even need to turn the page to do both. I can't think of any one character that I have read before, that I have loved and cared for as much as Nessa. I found her story utterly heartbreaking, yet wonderfully uplifting. Jessica Thompson's talent truly shines throughout the book and it is obvious she has but her heart and soul into writing this wonderful book. As I have already mentioned, the characters in this novel are superbly written and beautifully developed. Nessa is one of the best characters I have ever had the pleasure of reading about. She has gone through so much in her life, yet she continues to pick herself up again and again. She is so strong and independent and is such an admirable character. I adored her. From the very first page of this novel, I developed a soft spot for Will, Nessa's best friend. He too is wonderfully written and gives the book a certain sparkle. The friendship he shares with Nessa is just fantastic and one of the most beautiful relationships I have ever read. Poppy is a character that I really feel sorry for. She is clearly struggling with not having her father around and finding out that he isn't coming home, makes her go off the rails even more. Although Jake, is a character that we only hear about, I absolutely loved him. He is such a charismatic and likable character and I spent the duration of the book, on the edge of my seat, waiting to find out what had happened to Jake. Mick and Betsy, Jake's parents also caused me some heartbreak while I was reading this novel. Mick is suffering from Alzheimer's Disease and is unable to remember any of his family members. His wife, Betsy, is doing her best and to care for him, but is finding it tougher and tougher with every passing day. This adds a real depth to the story and brought more than one tear to my eye! This book has gone straight in as one of my all time top ten favourites. I am so looking forward to discovering Jessica Thompson's previous books. This book will make you, laugh, cry and smile. It is devestatingly beautiful and impossible to put down. The characters will stay with you long after you have read the final pages. You will not read another book as beautifully written or heartbreaking this year!